The Ioniq Hybrid lowers your fuel costs remarkably. The automotive landscape is in constant flux, with crossovers the current rage and small cars seemingly forgotten. Manufacturers such as Ford and Fiat Chrysler are running away from cars, placing their bets on SUVs and pickup trucks. Hyundai offers its own line of crossovers too, including the subcompact Kona reviewed here previously. But when it comes to cars, including electrified vehicles, Hyundai is keeping its foot on the pedal. Indeed, the 2017 release of the Ioniq line demonstrates the company’s commitment to electrification. Importantly, that commitment is firmly in place as fuel prices rise to the highest levels we have seen in many years. Ironic, is it not? Nope, Ioniq — as in a product line composed of hybrid, plug-in hybrid and electric vehicles. Each model is front-wheel drive and seats five. The Hyundai Ioniq Hybrid made its debut in 2017 and returns with just a few minor changes. Hyundai offers the 2018 Ioniq Hybrid in Blue ($22,200), SEL ($24,000) and Limited ($27,550) trims. Add $885 for the destination fee. Right here, you can see the Ioniq Hybrid is affordable. The base model undercuts the standard Prius by $1,275, although it costs $1,570 more than the tiny Prius C. If you are comparing the two, look at the standard Prius. One of the most significant things about the Ioniq Hybrid is its fuel efficiency. The base Blue model makes an EPA-estimated 59 mpg in the city and 57 mpg on the highway. All other models carry a rating of 55/54 mpg city/highway. That is a net difference of 3 mpg, but consider this: upgrading to the SEL brings in several desirable features. These include blind spot detection with rear cross-traffic alert, a power driver’s seat with lumbar support and heated front seats. You will pay $1,800 more for this upgrade, but you will still have a vehicle that is more efficient than the Prius and better equipped too. At first glance, if you mistake the Ioniq for an Elantra, that is entirely understandable. The two share a common platform and the look of the Ioniq offers light changes to the front. 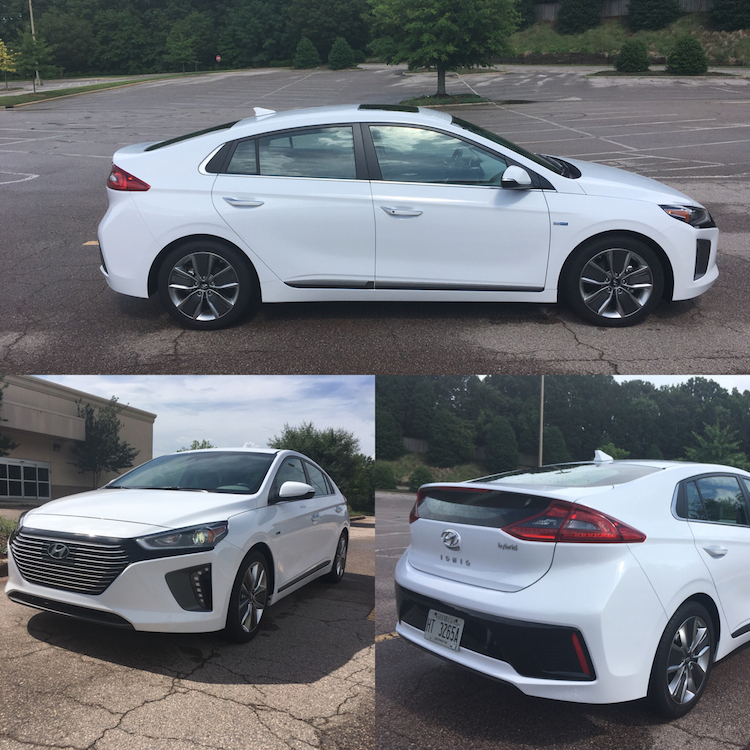 It is at the rear where the differences are noteworthy as the Elantra has a trunk, while the Ioniq supplies a hatchback. Even then, the Ioniq’s rear is different from the Elantra GT hatchback as the Ioniq features a notched design, appearing more trunk-like than the Elantra GT. Unlike Toyota, Hyundai wanted its electrified vehicles to blend in. Standard equipment includes automatic headlights, active grille shutters, 15-inch alloy wheels and a rear spoiler. Among the optional features are HID headlamps, LED daytime running lights and taillights, heated side mirrors, 16- and 17-inch alloy wheels and a sunroof. The Ioniq’s cabin offers a fair amount of room. You can tightly fit five, but four is more like it. Behind the front bucket seats is a 60/40 split fold-down bench seat. You will find 26.5 cubic feet of standard storage space. Remember: this is a hatchback and the storage space reflects that. Hyundai paid special attention to the dashboard layout, placing controls within easy reach and making them easy to discern. It does not have the gimmicky shift lever found in some models. And the center console is straightforward with connectivity points at the base of the unit. The front seats are adequate and supply sufficient bolstering. 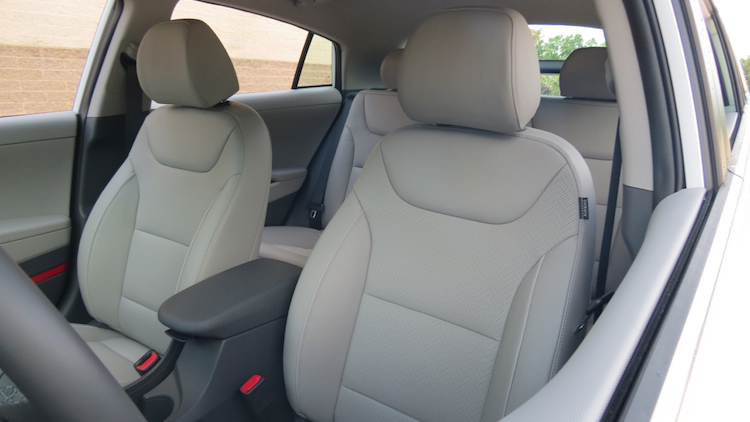 Hyundai positions the seats low just as they do in the Elantra sedan. My test model had the leather seats, but most models come covered in cloth. Standard equipment includes power windows, power door locks, a tilt-and-telescopic steering column, dual-zone climate control and cloth seats. 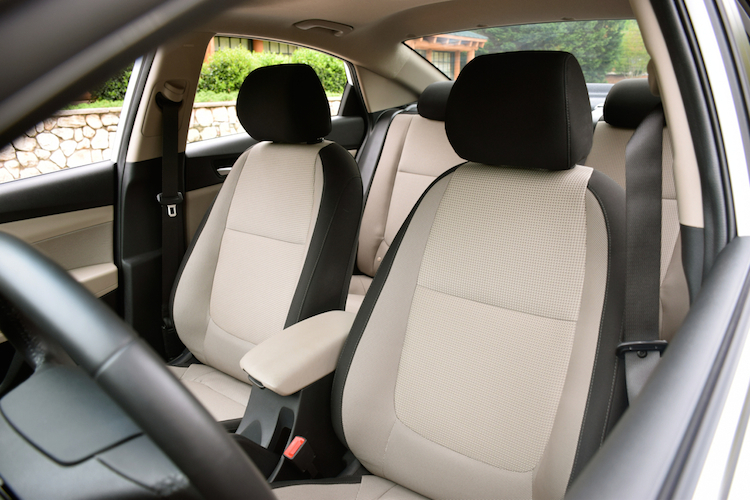 Among the upgrades you will find a power driver’s seat with lumbar support, heated front seats, leather seats, and a rear cargo cover. The standard audio package includes satellite and HD Radio. You will also find USB and auxiliary input jacks, Apple CarPlay and Android Auto smartphone compatibility, Bluetooth connectivity, and a seven-inch display audio screen. Upgrades include Blue Link telematics, an eight-inch color display with navigation, and a nine-speaker audio system. Among safety features you will find a standard rearview camera. Moving away from the base model equips the 2018 Ioniq with blind spot detection with rear cross-traffic alert and lane change assist. To acquire the advanced driver-assist technologies, you have two options. Neither package comes with the base model. The first option is the Tech Package for SEL ($1,000). It comes with automatic emergency braking, smart cruise control and lane keep assist. Smart cruise control allows you to set your speed, but it makes adjustments based on the vehicle you are following. This means if you have the cruise set to 55 mph and the vehicle in front is traveling at 50 mph, the Ioniq will slow to the lower speed. This is one of my favorite features. The second option is the Unlimited Package for Limited ($3,000). Besides adding numerous creature comforts, this one adds dynamic bending light technology, which pivots the front lights slightly as you turn the steering wheel, gaining a wider lighting perspective in the process. This package builds on the SEL’s and adds rear parking sensors. 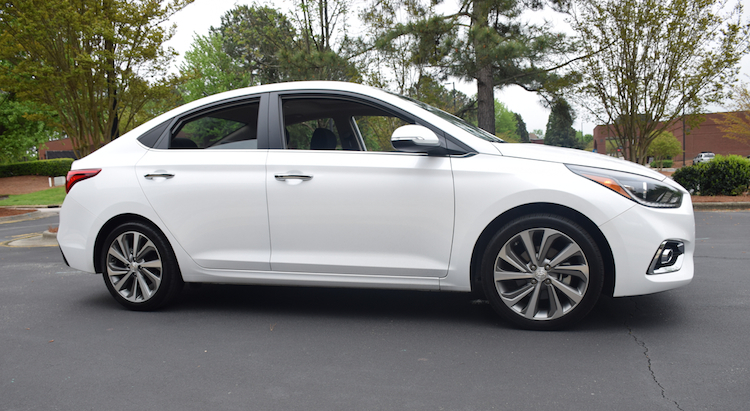 The Hyundai Ioniq shares its platform with the Hyundai Elantra, but the two models are considerably different, especially from a performance perspective. The standard Elantra throws down 147 horses to just 104 in the Ioniq. The braking feel with the Elantra is firmer, while the Ioniq Hybrid feels squishy, but not unlike other hybrids. Yet, the Ioniq Hybrid does have a bit of a kick at its disposal, especially when you hammer the gas pedal. That is when the power from the electric motor kicks in, supplying this model with 139 net system horsepower. Suddenly, that leisurely drive picks up the pace to an acceptable level. No, you will not tackle the twisties nor carve corners with this model — steering is very light to the touch and handling feedback is minimal — but you do have enough power to get out of the way of the Super Duty bearing down on your rear. I did not verify fuel economy following my 254-mile travel time with the Ioniq Hybrid. What I did notice is that the fuel gauge rested exactly in the middle and that brought me much satisfaction. At the very least I earned 42 mpg, which is considerably less than what Hyundai claims this model makes. On the other hand, I pushed the Ioniq Hybrid hard and rarely used cruise control. I am not your average green car driver, but I can see how reaching 50 mpg or better is possible. Watch out, Prius! The Hyundai Ioniq has you in its crosshairs. No doubt, Prius faithful will stay with Toyota, continuing to enjoy this model’s stellar reputation. That said, there are many other drivers who might consider a hybrid, but either do not like the Prius’ look or simply want something different. In the Ioniq family, Hyundai delivers everything — a standard hybrid, a plug-in hybrid and an electric vehicle (although the EV is currently available in California only). I cannot recommend the base Ioniq, even though it offers the best fuel mileage. You can still get an economical hybrid with the other two trims and enjoy the additional amenities that go with it. My pick here is the SEL with the tech package. For about $26,000 you get a well-equipped compact hybrid. Current lease and finance offers may be worth exploring. On the other hand, the similar Hyundai Elantra is also worth exploring. It costs thousands of dollars less and often has strong cash deals associated with it. I cannot go into details as these offers regularly change and you may be reading this article months or years later. In any event, a small Hyundai can bring big value with it and the Ioniq’s presence is most welcome as gas prices climb. 2018 Hyundai Accent photos copyright Auto Trends Magazine. All rights reserved. Entry-level Hyundai Accent is new and impressive. The 2018 Hyundai Accent is an all-new subcompact sedan. Available in three trims, a fully loaded model can be had for under $20,000. If “entry level” represents the 2018 Hyundai Accent, then you find yourself in a laudable position. 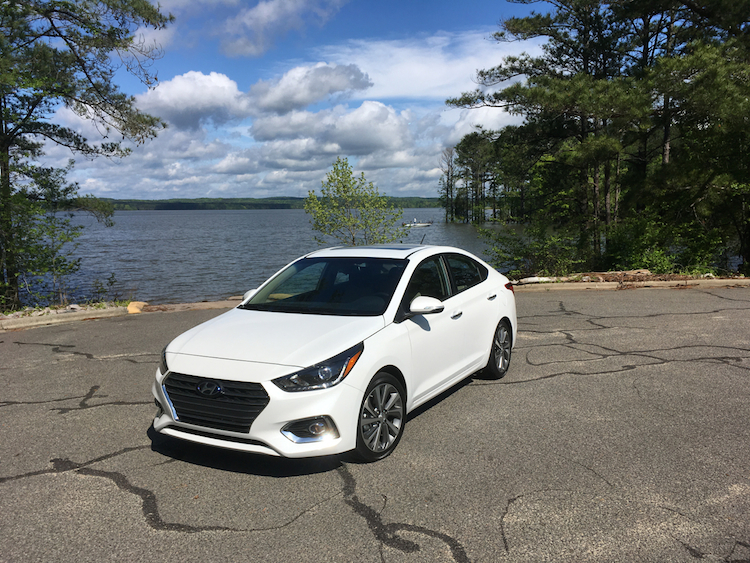 Hyundai’s smallest model has always had its accent on value, but its latest version is handsome, nimble and supplies a quiet cabin. The Hyundai Accent remains one of the few new models you can buy for about $15,000 with a well-equipped Limited coming in at just under $20,000. Now in its 24th year and launching its fifth generation, the latest model comes as a five-door sedan only. Canada and Mexico continue to enjoy a five-door hatchback too. The 2018 Accent is a front-wheel drive, subcompact model with room for five. It is available in three trims: SE, SEL and Limited. My test model was the Accent Limited with a final price of $19,905. Hyundai is always aggressive with its retail cash and/or financing offer. We have not seen a lease on the Accent in about a year — my recommendation is to buy one. If you must finance, you will likely acquire the title within five years. That leaves another five years of Hyundai’s powertrain warranty to keep you covered. Customarily, I review models as a whole, leaning heavily on the trim presented to me. That almost always means the top trim, which also means you do not always have an accurate picture of the models available. So, instead, we will break things down by trim and include pricing information. However, we do not include the $885 destination fee or taxes, tags, insurance or other expenses. As for discounts and other specials, you will need to head over to the Hyundai retail site for the current details. All 2018 Accent models come with a 1.6-liter four-cylinder engine with an output of 130 horsepower and 119 pound-feet of torque. Hyundai pairs this engine with a six-speed manual transmission. If you prefer the six-speed automatic standard elsewhere, add $1,000 to your price. Standard exterior equipment includes power side mirrors and 15-inch steel wheels. Inside, you will find power windows, power door locks, a tilt steering column, air conditioning, cloth seats and a 60/40 split-folding rear bench seat. Tech features include a 5-inch color display, a four-speaker audio system, Bluetooth, and USB and auxiliary audio ports. Among the safety highlights you will find a rearview camera with dynamic parking guidelines. As is usually the case, moving away from the base model brings with it important benefits. Typically, this is where we recommend shoppers start their search as there are multiple amenities not available elsewhere offered there. To begin, the Accent SEL comes with automatic headlights and puts disc brakes at all four corners. You will also find heated side mirrors and 15-inch alloy wheels. 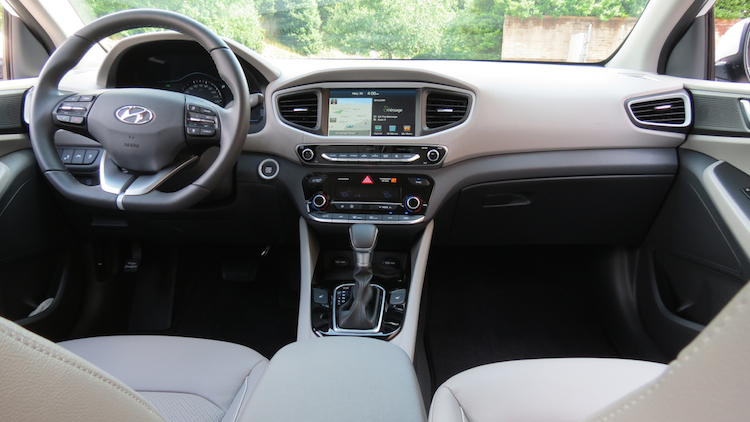 Inside, Hyundai adds a center console with a sliding cover and includes a front passenger seatback pocket. Among the tech items, there is a six-speaker audio system with satellite radio. Hyundai also brings in Apple CarPlay and Android Auto compatibility, a rear USB charging port and a seven-inch color display. The Android and Apply smartphone features are a big deal for many drivers. 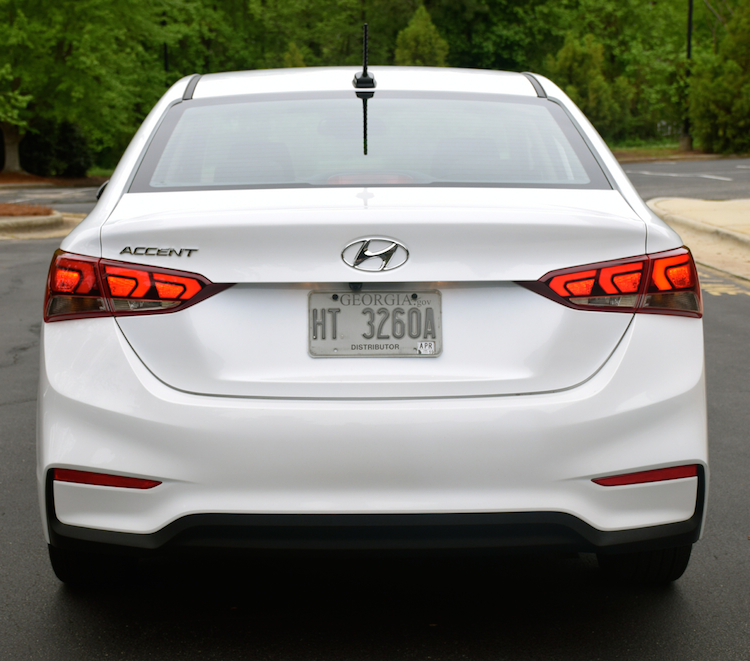 The Accent Limited is the model that seems most like the Sonata, Hyundai’s popular midsize sedan. In fact, if you called it a “Baby Sonata” you would not be too off the mark. This model has chrome touches on the grille and beltline molding and LED daytime running lights and LED tail lamps. Further, Hyundai includes projector headlights, front fog lights, 17-inch alloy wheels and a power moonroof. 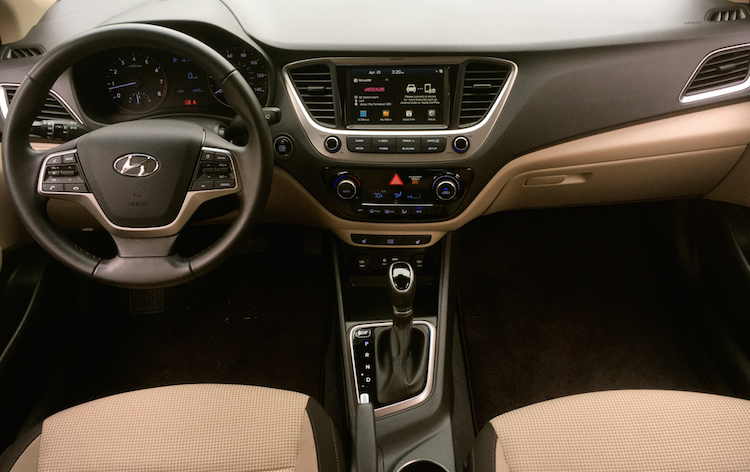 Inside, Hyundai supplies a leather-wrapped steering wheel and shift knob, heated front seats, automatic temperature control and an information display. On the tech front you will find a proximity key with push-button start (the car senses your presence and unlocks the driver’s door), a hands-free trunk and the Blue Link connected car system. Here, you get a three-year complimentary Blue Link subscription, what provides such features as remote engine start (not on the manual), in-car maintenance scheduling, remote lock and unlock and car finder. It works with your iPhone, Apple Watch, Amazon Alexa, Android, Google Assistant and smartwatches powered with Wear OS by Google. The Accent Limited also supplies forward collision-avoidance assist, not available on the other trims. What you won’t find with with any Hyundai Accent are packages as everything comes built into the respective trim. On the other hand, you can opt for dealer-installed accessories, including a cargo tray ($80), mudguards ($115) and carpeted floor mats ($125). The Accent’s appeal is for budget-minded owners and it succeeds in that endeavor. Regardless of trim, all models have a 1.6-liter, four-cylinder engine. With an output of 130 horsepower, you will enjoy considerably more horsepower than what similar-sized engines produced just a generation ago. Hyundai uses gasoline direct injection, delivering gasoline directly into the combustion chamber of each cylinder. The technology means your Accent moves faster and burns less gas, although we noticed the engine is loud under hard acceleration. And as for efficiency, we’ve seen larger engines in bigger cars return a higher number than the 38 mpg highway for the Accent. Although we cannot count on the workings of the manual, we can do with the automatic. The automated gearbox is best operated in drive mode where the shift pattern is cleaner. Yes, we noticed the Accent’s transmission has a tendency to stretch out gear shifts longer than what we like and at times hunt around for the right gear under full throttle. Steering is light and loose feeling, not exactly supplying certainty or clarity on the road. Working in the Accent’s favor is its size, which makes it easy to enter and leave tight spaces. The Accent won’t win plaudits for ride comfort, particularly on washboard surfaces. At least you’ll know which portions of the road to notify the DOT of needed repairs. 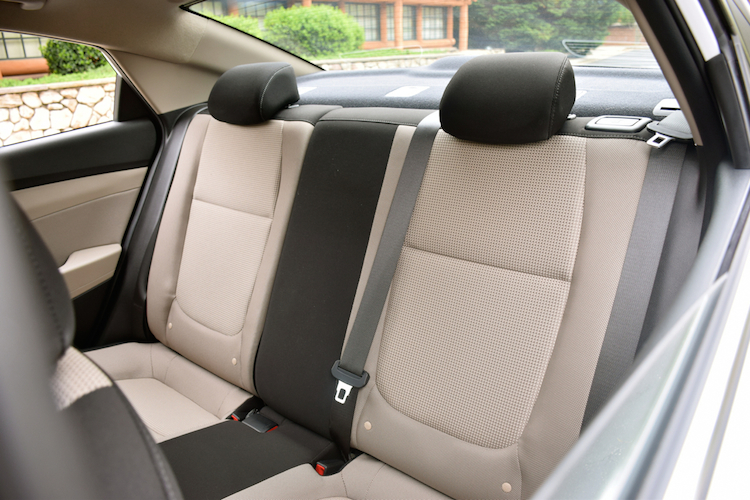 The front seats are supportive with ample head and leg room. 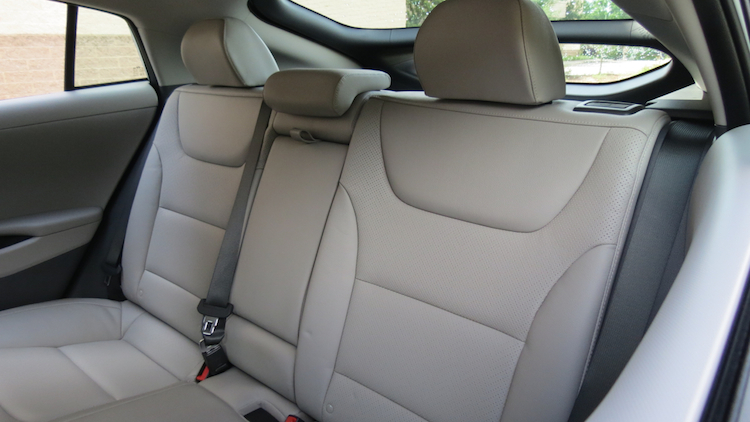 Rear seat access is tight, but once you’re seated that space easily rivals some midsize cars. Just don’t expect to seat three adults, even in a pinch. The Hyundai Accent is the attainable car for consumers who might also consider a late-model used car. That said, if you are in a favorable financial position, then the Accent Limited is the best choice, simply for its many amenities. Hyundai remains strong in the car space, even as some competing manufacturers pull back or limit their offers. Not only will you find the compact Elantra and midsize Sonata sedans, but a line of compact electrified vehicles under the Ioniq umbrella. This spring, the Veloster Coupe returns after a one-year absence, bringing with it a turbo and the first expression of the brand’s “N” performance line. Finally, always seeming to work in the Hyundai scheme of things is its class-leading warranties. From its fully transferable new car warranty to its lengthy powertrain warranty and onto its roadside assistance plan, Hyundai offers maximum protection combined with a minimum price. That represents value with a capital V.